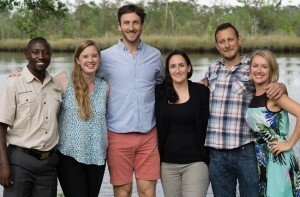 The EWCL Gorilla Team (“Gorilla Team” or “team”) originally planned to research, create, test, and deliver a comprehensive tracking and monitoring system for reintroduced Grauer’s gorillas in the Democratic Republic of the Congo (DRC). In Phase 1, the team delivered initial research results to GRACE in November 2017, recommending a combination of remote monitoring technologies with a primary focus on testing and deploying a gorilla-proofed GPS anklet device. Given the time limitations for ethically testing such a device, GRACE identified a postdoc researcher to continue the anklet testing and monitoring research. The team then pivoted, and with the support of GRACE decided to focus Phase 2 of the project on an awareness and fundraising campaign leading up to the 2018 Giving Day for Apes, September 25th. The team came up with the idea for a virtual “#Race4GRACE” motivating supporters from around the world to donate in support of GRACE. The Gorilla Team exceeded their $8,000 fundraising goal, raising a total of $9,160 through direct donations via the Mighty Cause platform, and an additional $4,110 in matching employer donations (being finalized), and gathered support from 128 individuals representing 69 cities, 22 US states, and 5 countries. The $13,270 total funds raised by the Gorilla Team will go towards many of GRACE’s critical needs such as food for the gorillas, salaries and gear for the gorilla caregivers, medical supplies, tools for community engagement, and the planning of the eventual reintroduction of some gorillas back into the wild. In Phase 1, our team was initially focused on researching and testing the best available Post Release Monitoring (PRM) technology to be used by GRACE in their planned future reintroduction of Grauer’s Gorillas in the DRC. Our research focused on location transmitters (radio telemetry and GPS), attachable transmitters (anklets or implants), and other means for remote data collection (camera traps and/or drones). The team assessed peer-reviewed publications, communicated directly with technology experts (including “Lotek”, “BioTrack”, “Sirtrack”, and “Wildlife Drones”), and inquired with other experts with the Dallas Zoo, Apes Inc, and Panthera. We ultimately concluded that a combination of remote technologies (camera traps, anklets fit with radio telemetry, and drones for downloading telemetry data) would allow GRACE to monitor the location, movements, and health of rehabilitated female gorillas after the planned strategic population reinforcement of a wild gorilla group in Virunga NP. In early 2018, EWCL and GRACE determined that due to the long-term scope of the reintroduction project (likely far beyond the length of the two-year EWCL project), ongoing collaboration required with partner zoos involved in developing the anklet technology and ethically testing its use, and the deep expertise needed to design and test the technology, a shift in scope was required. GRACE identified a postdoc researcher to continue the anklet project while the EWCL team shifted gears. In April of 2018, during the start of Phase 2, the Gorilla Team offered to support GRACE with an awareness and fundraising campaign focused on a virtual “#Race4GRACE,” motivating supporters from around the world to donate to GRACE on the September 25th Giving Day for Apes. In Phase 2, the EWCL Gorilla Team created a dedicated Mighty Cause donation page, Facebook page, and Twitter account to promote GRACE and encourage supporters to join a virtual race to help us compete against other organizations and teams participating in the 2018 Giving Day for Apes. The team also created an original 2-minute promotional video featured on all of our platforms, which included original footage of the team, GRACE gorilla footage and images, and a voiceover from teammate Britius Munkombwe. The Gorilla Team set the fundraising goal at $8,000, based GRACE’s history of raising $5K-12K in previous years of participating in the Giving Day for Apes. The team’s incredible EWCL Board liaison Claire Martin connected the team with Morgan Richardson – a Disney imagineer artist – who offered to create a one-of-a-kind print drawing of a GRACE gorilla (“Mapendo”) for our campaign. The top 25 donors each received a copy of this unique Mapendo print. Furthermore, our team worked hard to amplify our outreach efforts online and through social media. We had help from Gus Kenworthy, an Olympic medal winner with one million followers on Instagram (and friend of a Gorilla Team member), and Africa Geographic, who published an article our team wrote on their website and in their social media (with 30K followers in Twitter and 1.05 million followers on Facebook). The Gorilla Team also activated our personal networks to spread the word. Members of our team organized #Race4Grace run/walks with colleagues from Disney, The Pew Charitable Trusts, and the Wildlife Conservation Network. The team also paid out of pocket for Facebook “boosts” which promoted our posts to certain select demographics. On the actual Giving Day for Apes, the team exceeded our goal and raised $13,270 dollars through Mighty Cause and employer matching donations. Once the campaign ended, the Gorilla Team distributed a survey amongst the #Race4Grace participants to learn more about its impact. Our detailed results are featured below. Finally, together with GRACE, we planned a race in the DRC, which unfortunately was delayed due to a recent, devastating, Ebola outbreak. The race will still happen in the near future and some of the funds that we kindly received from the SeaWorld Busch Gardens Conservation Fund Grant will be used to help organize it. This community relay “race” will work to inspire the local community to protect the wild animals they live with and to support GRACE, with participants receiving T-shirts, with winners invited to GRACE for a special educational visit. The EWCL Gorilla Team identified anklets with telemetry and RFID as the best option for tracking the gorillas. The team recommended against using microchips and implants after research and speaking with experts about difficulties due to poor battery life, transmission range, and the potential for gorillas to attempt to remove them. The team also identified drones and camera traps as additional and secondary methods of tracking the ankleted gorillas from a distance. GRACE welcomed our research and is using parts of our findings in moving forward with additional anklet testing and research. Our research and findings will help GRACE ensure best possible welfare for the gorillas and to meet the requirements of the IUCN Best Practices for Reintroduction of Great Apes. Most importantly, our work will contribute to saving an imperiled population of Grauer’s gorillas because monitoring is key to a successful reintroduction. As a result of this campaign, #Race4GRACE raised $9,160 with an additional $4,110 in matching employer donations, totaling $13,270. This total was greater than the funds raised by GRACE for Giving Day in 2017. Including the EWCL #Race4GRACE campaign funds, GRACE raised more than $25,000 this year, which will be used to help fund their veterinary and animal care programs. #Race4GRACE attributed approximately 53% of the total funds raised by GRACE for The Giving Day for Apes 2018. Overall, the #Race4GRACE campaign was the second highest individual fundraiser for an African sanctuary, which qualified GRACE to win an additional $1,000 in prize money. Their ranking as #2 on the “Most Funds Raised by an African Sanctuary” leaderboard qualified them for an additional $2,250. The EWCL #Race4GRACE campaign brought in donations from 128 people, from 69 different cities, in 22 US states, and 6 different countries. The campaign also brought in 94 new donors to GRACE. These first-time donors gave a total of $3,874, which accounts for 42% of the #Race4GRACE fundraising total, and approximately 15% of the GRACE overall Giving Day total. Throughout the month-long campaign, the #Race4GRACE Facebook page gained 228 followers, and generated 42 unique posts to engage donors through a variety of photos, videos, and interactive content.Although several of the individual Facebook posts had a greater reach, the #Race4GRACE Facebook page reached 1,092 people in 45 different countries, who speak 24 different languages. The #Race4GRACE campaign was most successful in connecting with women between the ages of 25 and 44. #1 - Isangi post – Reached 2,507 people, and received 42 clicks. This post was boosted, which means the team paid a fee to have the post advertised to a target demographic on Facebook. #2 – Map post – Reached 2,167 people, and received 178 clicks. This post was not boosted, which means the reach was organic. #3 – Team Introduction video – Reached 2,124 people, and received 275 clicks. Reach was organic. Our team plans to continue to share content on the page until it is fully handed over to GRACE staff, so that the page can be utilized as a resource for future fundraising efforts. In 2017, the EWCL Gorilla Team applied for and received $5,000 from the SeaWorld Busch Gardens Conservation Fund (SWBG) to use toward a prototype design and testing for anklet remote monitoring devices. In early 2018, we shifted our direction as the anklet project expanded in scope and was going to be developed further by a postdoc researcher in conjunction with GRACE. During our second EWCL training in April 2018, our team determined that we would help GRACE with an awareness and fundraising campaign (#Race4GRACE). Our team then applied for and received $1,000 from the Disney Conservation Fund (DCF) to support costs associated with this campaign. While post release monitoring is an extremely important component of the future reintroduction trials of the GRACE gorillas, we decided that our original SWBG grant needed to be amended as our team was no longer involved with the anklet project. SWBG was very agreeable to our amended proposal of splitting the funds with $3,000 continuing to support the GRACE anklet project and $2,000 to be used by the GRACE education team in the DRC for the community “relay” race. As previously explained, due to an Ebola outbreak this event is currently on hold but will be held once it is safe to do so. Of the $1,000 grant received from The Disney Conservation Fund, $235.80 was spent to cover the costs of postage to mail Morgan Richardson’s “Mapendo” drawing prints to the top 25 donors to #Race4GRACE. The remaining $764.20 of the DCF grant will be transferred over to GRACE to be used for their continuing conservation and education efforts. Those who wish to support GRACE should visit the GRACE website here and social media platforms to learn more about the gorillas and the organization. 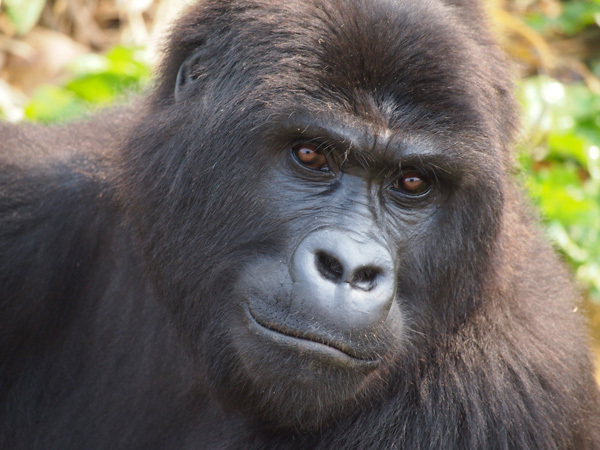 Supporters can help by donating, purchasing GRACE merchandise, or virtually adopting a gorilla. GRACE needs additional funds for food, medical supplies, keeper salaries, expansion and improvements to its facilities, preparation for the planned reintroduction, and more.